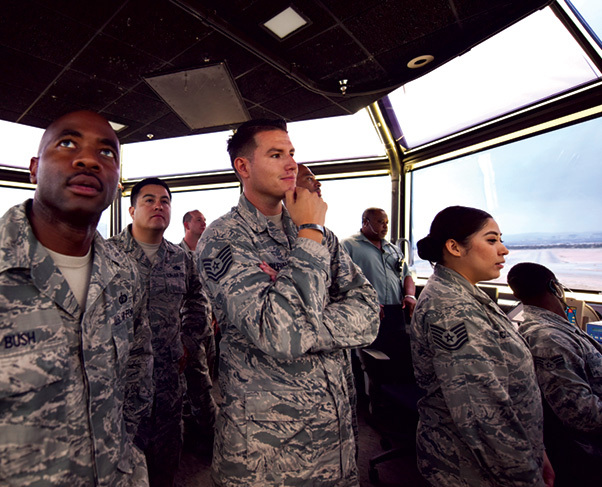 NCOs from units across the U.S. Air Force Warfare Center tour the air traffic control tower at Nellis Air Force Base, Nev., Aug. 16, 2018. The tour was part of the Warrior Stripe program where technical sergeants toured parts of the base they would not regularly see in their daily job. The U.S. Air Force Warfare Center concluded its first Tech. Sergeant Week/Warrior Stripe Program Aug. 17 at Nellis Air Force Base, Nev. The two-week course brought together 40 Warfare Center NCOs to provide an avenue for them to develop as military and professional leaders. 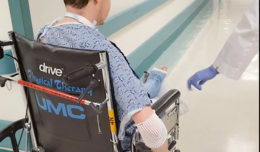 “The goal is for the folks that leave the course to see it as something different, something that changed them and made them think about things a little differently,” said Chief Master Sgt. Charles Hoffman, USAFWC command chief. The students were pulled from the Warfare Center and its supporting units, from crew chiefs and civil engineers to medics and communications. Tech. Sgt. Daniel Wolfrum, Thunderbirds plans and scheduling NCO in charge, was one of the students. He said that he had been looking forward to the course for a while and it exceeded his expectations. Airmen from units across the U.S. Air Force Warfare Center gather in the Thunderbirds museum at Nellis Air Force Base, Nev., Aug. 16, 2018. The tour was part of the Warrior Stripe program where technical sergeants toured parts of the base they would not regularly see in their daily job. The first week focused on military development and personal and professional development. Hoffman said the course focused on the National Defense Strategy and the big picture of why Airmen are here and why they do what they do. It also entails an in-depth look at who they are and how they deal with different learning styles to give them a greater understanding of how to work together as a team. 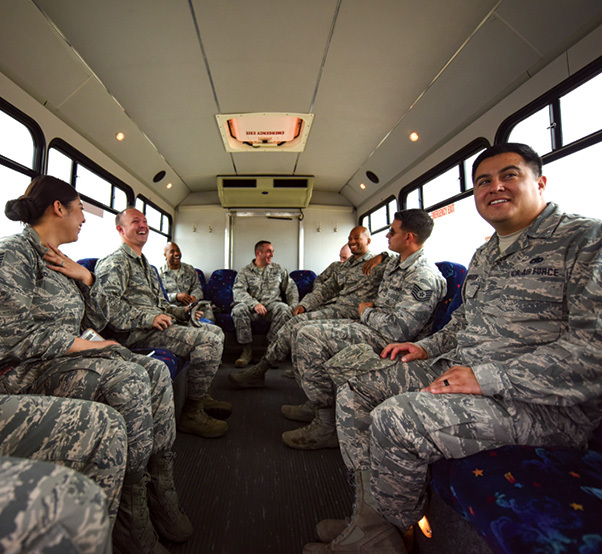 Air Force technical sergeants from units across the U.S. Air Force Warfare Center relax after their final tour of the day with the Warrior Stripe program at Nellis Air Force Base, Nev., Aug. 16, 2018. The two-week course brought together 40 Warfare Center NCOs to provide an avenue for them to develop as military and professional leaders. Only 10 of those 40 students moved on to the second week, when they traveled to units around the base to see everything from fighter jets to military working dogs. Most of what the students saw they would never experience without the course. Hoffman said the week specifically focused on technical sergeants, because there are not many development courses available for them once that rank is achieved. Wolfrum and Hoffman agreed that technical sergeants have a lot of roles and responsibilities and that this course could help develop them further as better NCOs. 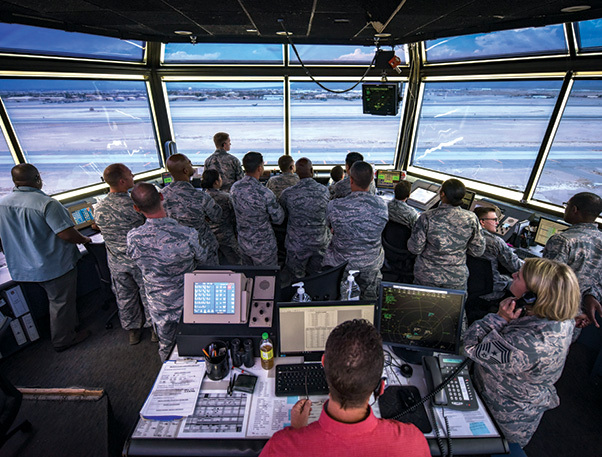 Air Force technical sergeants from units across the U.S. Air Force Warfare Center tour the air traffic control tower at Nellis Air Force Base, Nev., Aug. 16, 2018. The tour was part of the Warrior Stripe program where technical sergeants toured different parts of the base that they would not regularly see in their daily job. Staff Sgt. 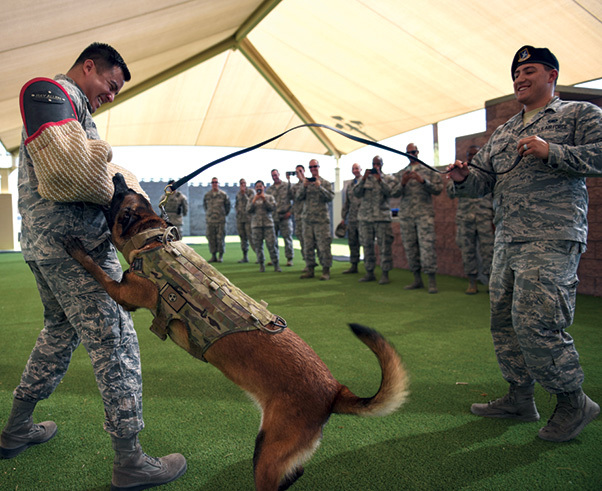 Ryne Wilson, 99th Security Forces Squadron military working dog handler, and his K-9, Sseneca, perform a demonstration on Tech. Sgt. Randy Corrasco, 926th Wing quality assurance inspector, for the Warrior Stripe program at Nellis Air Force Base, Nev., Aug. 17, 2018. 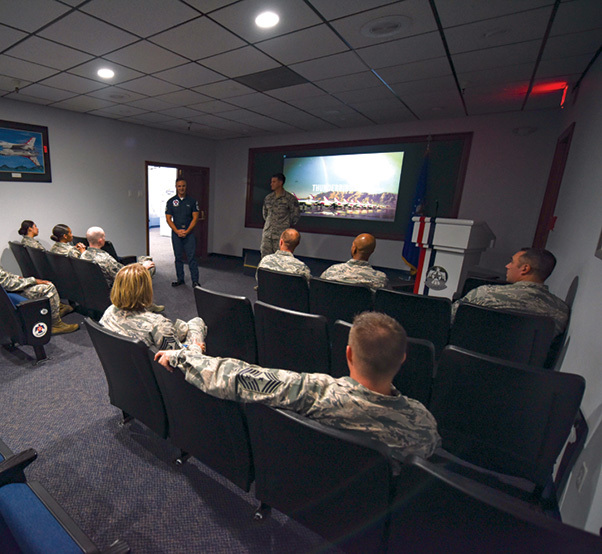 The two-week course brought together 40 U.S. Air Force Warfare Center NCOs to provide an avenue for them to develop as military and professional leaders. Tech. Sgt. 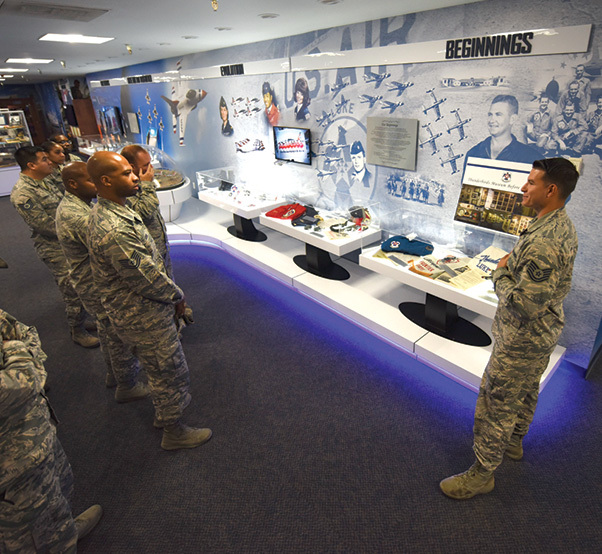 Daniel Wolfrum, Thunderbirds plans and scheduling NCO in charge, conducts a tour of the Thunderbird museum at Nellis Air Force Base, Nev., Aug. 16, 2018. The museum displays Thunderbirds heritage, memorabilia and current team members. Chief Master Sgt. 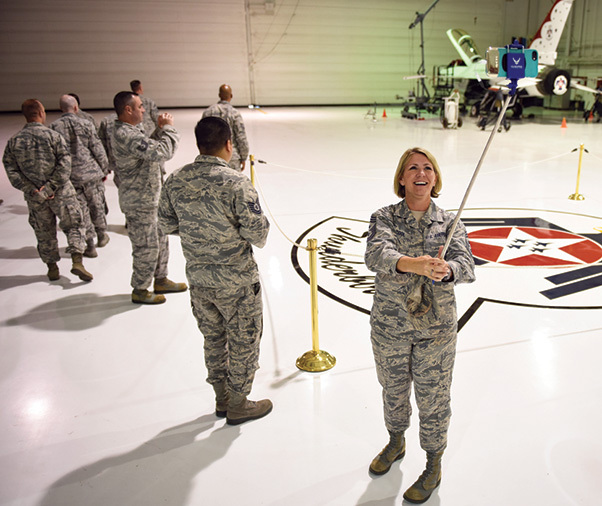 Kathleen McCool, 53rd Wing command chief at Eglin Air Force Base, Fla., takes a picture in the Thunderbirds hangar during a tour with the Warrior Stripe program at Nellis Air Force Base, Nev., Aug. 18, 2018. The two-week course brought together 40 U.S. Air Force Warfare Center NCOs to provide an avenue for them to develop as military and professional leaders. 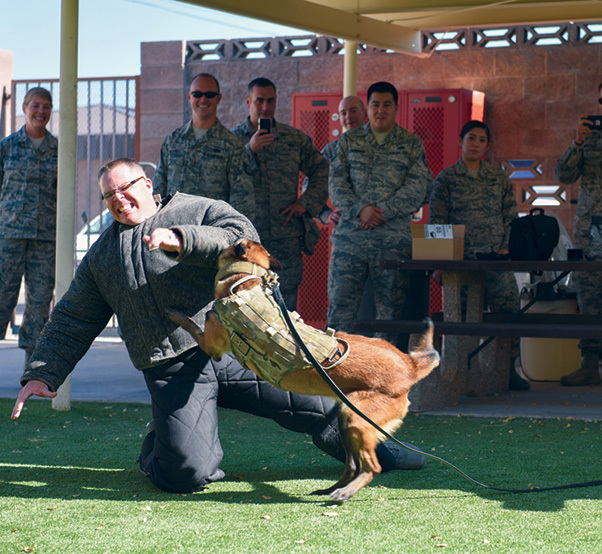 Airmen from units across the U.S. Air Force Warfare Center observe a K-9 display for the Warrior Stripe program at Nellis Air Force Base, Nev., Aug. 16, 2018. The students were pulled from the Warfare Center and its supporting units.